Thanks to the resistance and determination of the Algonquins of Barriere Lake, the thousand people who sent online letters and the 200 who joined last week’s powerful Montreal demonstration outside the offices of Resolute Forest Products and Premier Jean Charest, the Quebec government and forestry company have been forced to make a significant concession. They have agreed to respect an aspect of the Trilateral agreement by harmonizing logging with Barriere Lake's use of their lands, which is an important step forward in the community’s struggle to protect their land rights and the environment. 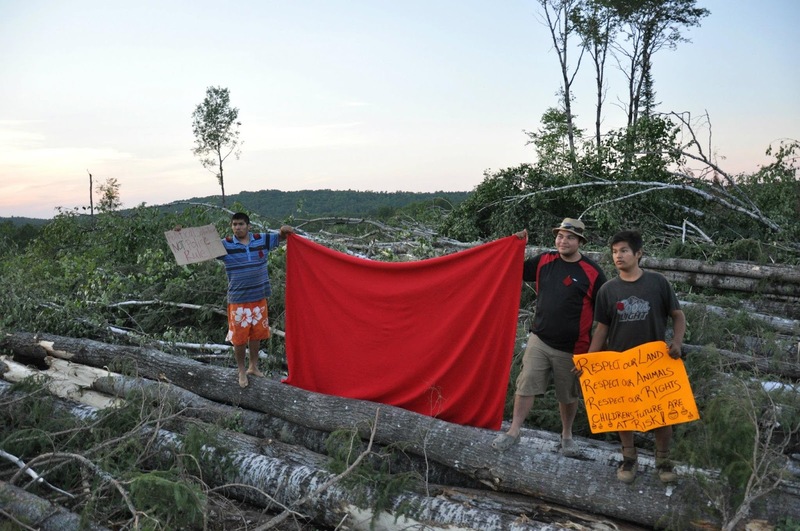 After the protest in Montreal a week and a half ago, and after a number of successful stoppages of the forestry operations by Algonquins camped out for two weeks, the Quebec Ministry of Natural Resources sat down for negotiations with community representatives. What was agreed to is a precarious but important step in the community’s long struggle to pressure the Quebec and Canadian governments to honour their landmark Trilateral Agreement. The logging that had been happening on Barriere Lake’s land was illegal because Quebec has refused to implement the Trilateral Agreement, without which no forestry operations should be happening. The agreement is intended to create a sustainable model of forestry in which Barriere Lake jointly manages 10,000 square kilometres of their traditional territory with the province. 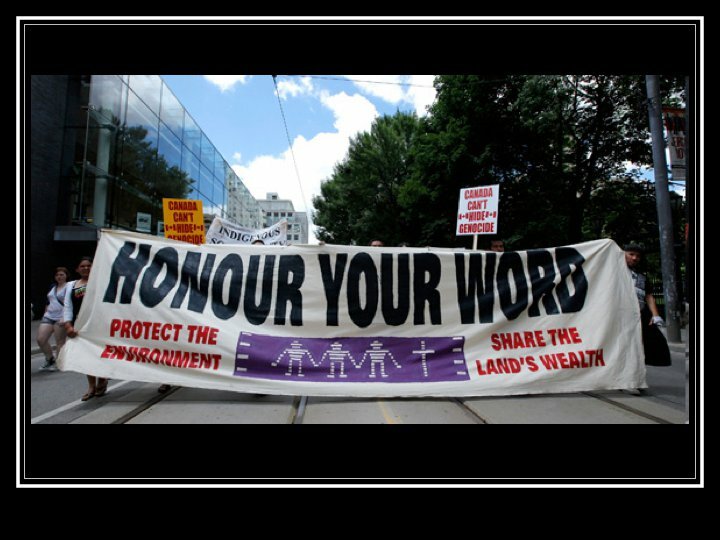 The agreement is a model for First Nations fighting to protect their land rights. happen where the community has hunting cabins, in areas of moose and bear habitat, sacred areas, medicinal sites and many other areas of concern to the community. Because of community's direct action and public pressure, the Quebec government and Resolute Forest Products have now agreed to comply by the “measures to harmonize”! Barriere Lake needs its supporters to remain vigilant to ensure Resolute Forest Products respects the "measures to harmonize." Even more importantly, we need to continue building pressure on the Quebec and Canadian governments to finally implement the Trilateral and Bilateral Agreements. The Charest government has been so brazen in its disregard for the law and its contempt for Barriere Lake that it has refused to honour the binding outcomes of negotiations conducted by two former Liberal Cabinet Ministers! In 2006, a negotiator for the Quebec, John Ciaccia, and a negotiator for Barriere Lake, Clifford Lincoln, issued the recommendation that the agreement be implemented. Quebec does not want to implement this agreement because it sets precedents in giving Indigenous peoples control over developments on their territories. 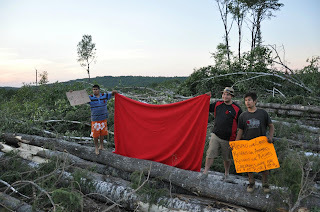 July 16, Poigan Bay, QC – As the standoff between the Algonquin community of Barriere Lake, QC, and Resolute Forest Products (formerly known as Abitibi-Bowater) enters its thirteenth day, members of the Algonquin community are moving their protest camp site closer to logging operations to prevent further cutting. Algonquin families have camped alongside the road where logging has been destroying the community's sacred sites and moose habitat, and have succeeded in periodically stopping the cutting. Quebec police, including a riot squad from Montreal, have escorted the loggers and maintained a large presence, issuing threats of arrest to community members. The Montreal-based multi-national company's operations have been licensed by the Charest government without the Algonquin community's consent or consultation, and in violation of the Trilateral Agreement the Quebec government signed with Barriere Lake in 1991. “I was not properly consulted nor did I provide consent to this logging within our territory,” said Algonquin elder Gabriel Wawatie, whose family territory is being clear-cut, in a letter last week to Premier Charest and the Quebec Ministry of Natural Resources that has not been responded to by the Liberal government. "The Charest government has acted in bad faith, giving this company the go-ahead to log while they ignore their signed agreements with our community," said Norman Matchewan, a community spokesperson. "It has left us with no choice but to try to stop forestry operations. We have been waiting 20 years for the Quebec government to honour it." Barriere Lake wants Quebec to honour the Trilateral agreement, a landmark sustainable development agreement praised by the United Nations. The Charest government has also ignored the formal recommendations of two former Quebec Liberal Cabinet Ministers, Quebec representative John Ciaccia and Barriere Lake representative Clifford Lincoln, that the agreement be implemented. The agreement is intended to allow logging to continue while protecting the Algonquins' way of life and giving them a $1.5 million share of the $100 million in resource revenue that comes out of their territory every year. A casserole demonstration in support of the Algonquins of Barriere Lake has been called for this Wednesday (July 18th) at 11:30am, at the Resolute headquarters in Montreal. 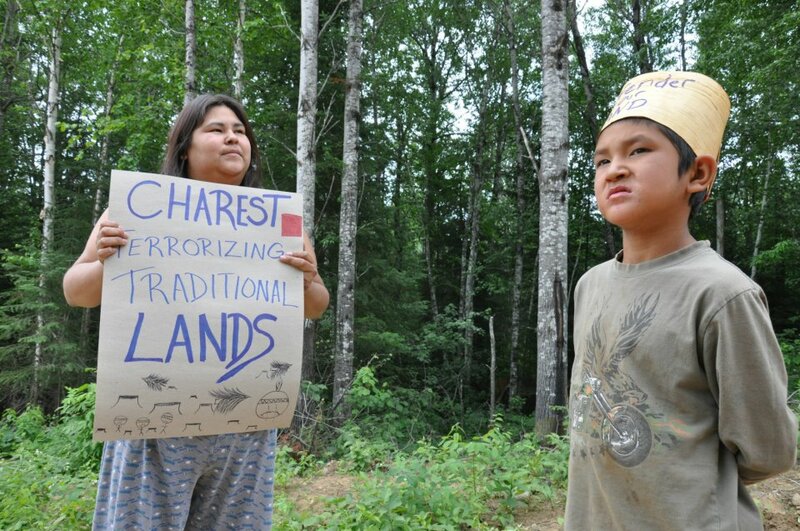 July 9, Poigan Bay, QC – Resolute Forest Products, formerly known as Abitibi Bowater, began cutting last Tuesday on land of the Algonquins of Barriere Lake without proper community consultation or consent. The logging is taking place near Poigan Bay, Quebec, on land that includes sacred grounds and important moose habitat, according to community spokesperson Norman Matchewan. Despite the lack of consultation, the Ministry of Natural Resources office in Maniwaki issued permits for the logging to take place. Last month, in a recent provincial court case, the same forestry company (Resolute Forest Products, formerly known as Abitibi Bowater) attempted to sue one of the youth leaders of Barriere Lake, Norman Matchewan. Vincent Larin, from the Maniwaki Ministry of Natural Resources office, issued two cutting permits for the same logging site (cutting block) in Barriere Lake territory that also included sacred sites. Fortunately, the forestry company lost their court case when the foreman contradicted his original statement and got caught lying on the stand. In recent years, the community of Barriere Lake has resisted numerous resource extraction projects slated for their land. Most recently, members of the community confronted mining company Copper One at the company’s AGM in Montreal, opposing their mining exploration on Barriere Lake territory. Thank you to all who sent messages in support of the community. This tool is no longer opperational.